My father had built it for me, his little princess. A double-storied mansion with pillars in the front and a courtyard that went all around the royal structure. It had a steepled roof that was painted a bright red: my favorite colour. He built me bedrooms, stairs and a kitchen. And four little white beds for the four bedrooms. My father said they were all mine. I watched in amazement as daddy built me my fortress. He took care of every detail, making sure it was perfect. It was the most beautiful mansion I had ever seen. He even got me a majestic car: My very own Rolls Royce. Painted black, its shiny brass and copper engine shimmered brilliantly in the sunlight as it adorned the lush green courtyard. I hugged him. It was the best gift he had ever given me: My very own mansion. Today, I live in a small, rented apartment in a busy suburb. My double-storied mansion, red steeple and all, never survived the vagaries of time. That aging shoebox had to give way someday. Even the bright red paint that had dulled over the years, could not disguise the weathered shoebox that my father had magically transformed. The Rolls Royce — a freebie that came with the bright yellow noodle packets Mother made every Sunday night — had stopped running years ago, its shiny engine, rusted and disfigured. Twenty-three years later, that ragged, old shoebox lies stashed away in some forgotten corner and I’m clueless about the whereabouts of the Rolls Royce. But the memories are still here — fresh as the first coat of red paint that cleverly concealed the scalloped edges of the shoebox. I remember sitting cross-legged — across from daddy — as he carefully cut into the soft cardboard, carving out the windows. I watched as he painted the roof a fire-engine red, and taped a toothpick that was to become the ‘spire’. I was daddy’s very own helper, an eager five-year-old, handing him the scissors and tape whenever he needed it. It was one of those epiphanous moments when I watched, open mouthed, as my father transformed an ordinary shoebox into a magnificent castle. An enchanting fairyland. It was my very first experience with the magic of love. 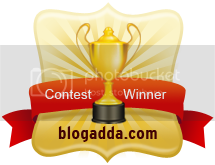 Note: This post is in response to Blogadda’s Tribute to Dad contest, in partnership with PringOO.